More and more people now recognize that having a bidet toilet seat isn’t just a luxury. It has become more of a necessity, as bidets are considered a more earth-friendly alternative for toilet paper. Can you imagine how awful it would be when you find that you’ve run out of toilet paper after doing your business? 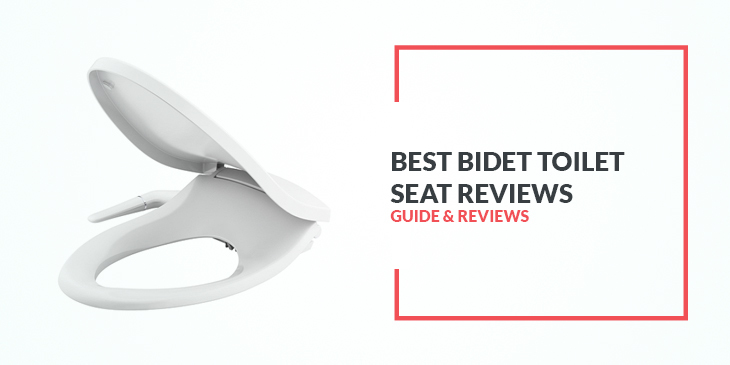 With the best bidet toilet seat, you don’t have to worry about those nightmarish scenarios. Better yet, you can clean yourself better after using the toilet. Curiously, bidet toilet seats have been widely used around the world, but it is only now when Americans are starting to realize the benefits of having one in the toilet. They can be mistaken as a small bathtub because of their appearance. Bidets are often placed near toilets for convenience. Bidets are not only designed to warm your bottom but also let you clean yourself with warm water. The more luxurious ones can dry your bottom with warmed air. Others are so smart that it can spray a fine mist in the bowl once it detects that you are about to sit on the throne. Brondell S1000-EB Swash 1000 Advanced Bidet Elongated Toilet Seat has separate spray jets for cleaning the posterior and feminine area. It can also provide unlimited warm water with its instant ceramic heating system. Aside from the water temperature settings, there is also separate temperature control for the seat. It also has deodorizer and massage or nozzle oscillation feature. I liked that it has a nice, stainless free nozzle that makes it look more stylish. The deodorizer removes the stench after you do your business. Its separate spray jets for the posterior and female areas work well. Plus, the seat is kept warm. There are instructions for installation which are clear and easy to follow. We just find it a bit expensive. The electrical and plumbing bits are quite an eyesore. And it is disappointing that the deodorizer does not come out automatically. Bio Bidet Ultimate BB-600 advanced bidet toilet seat features separate nozzles for cleaning the posterior and sensitive female parts. It is kid-friendly as well. It is eco-friendly, too, with an energy saver mode that reduces electricity use. We like that the control panels are located on the side, making it inconspicuous. Selection lights for water pressure, temperature, and nozzle positioning buttons making it easy for users to keep track of them. The slow close function for both the seat and lid means there is no chance for users to slam the lid loudly. The electrical cord is placed in the center of the back of the seat so that it can be connected to right sided or left sided electrical outlet. It is disappointing that the drying function isn't that useful. The water heating doesn’t work well after a few months. TOTO SW2034#01 Elongated C100 Washlet toilet seat measures 23.5 x 20.5 x 9 inches. It boasts of adjustable water temperature and volume. It also pre-mists the bowl before use and has a conveniently placed arm control panel. It then sprays a gentle, aerated warm water. The heated, soft close seat will also warm your bottom. This one is relatively easy to install, as you only need a Phillips head screwdriver and adjustable end wrench. There's also an instruction manual with a diagram to guide you in installing this unit. The pressure switch mists the bowl before you do your business. It has a large seat that should accommodate all types of individuals. It also has a smart energy option; seat only heats up during times of routine use. The blow dryer can dry up your bottom quickly, and its automatic deodorizer system works after you stand up, removing unpleasant odors. But its accessories like an expansion hose are also not cheap. Because the seat is large, children may have difficulties using it. Clean Sense dib-1500R unit makes use of an advanced hybrid water heating system so you can get your warm water all the time. It has a hot/cold seat indicator light so you would know right away if the seat is warm or not. It also has features like adjustable nozzle, seat sensor, smart energy saver, and warm air dryer. I appreciate that it can give a continuous flow of warm water with its advanced hybrid water heating system. The hot/cold seat indicator light means you won’t be surprised when you sit on the toilet bowl. There are safety sensors will prevent your kids from playing/wasting water. It is easy to install, too. We just didn’t like that the backlit display on the remote control is still difficult to read in low lighting. The seat is a bit small for large people, too. KOHLER K-5724-0 Puretide elongated toilet seat requires no electrical outlet or batteries. Instead, it operates with an easy-to-use lever. It has a quiet-close technology that ensures the lid and seats are closed quietly and closely. The hinges are easy and quick to remove for thorough cleaning. There are also bumpers that can add stability and prevent shifting. I like that it has a very sleek and elegant design. The contoured seat design cradles your bottom very well, and maintenance/cleaning is easy. The quiet-close technology prevents users from slamming the lid. It is relatively easy to install. The nozzle has three different spray heads. It has all the updated features like other Kohler products. But the seat is a bit loose, tends to move rather easily. It is made of lightweight plastic, which isn’t the most durable of materials for bidet toilet seats. EllegantzGenieBidet toilet seat is designed to fit most elongated toilet models. It features a nozzle that extends from under the seat, giving you​​​​ refreshing, aerated water cleanses and eliminating the need to reach for toilet paper. It has a contemporary, low profile sleek design with separate nozzles for female and posterior cleansing. It has a soft close seat and chromed brass around the hose fittings. It’s disappointing though that the seat is a bit small for large people. It also has the tendency to slip backward constantly. EllegantzGenieBidet Seat Standard Toilet Bidet Seat one is similar to item no.1, but it works only for elongated toilets only. Like the other Ellegantz bidet toilet seat, it has separate nozzles for cleaning your rear and feminine parts. It also has that sleek design, soft close seat, and adjustable sprays. It measures 21 x 18 x 3 inches. I love that it is easy to clean, snaps on and off in seconds. The installation manual is available online. And the spray pressure for both posterior and feminine cleansing is good, but not strong enough for users to be uncomfortable with it. The seat is comfortable for most users. The control levers are conveniently placed on the right side. And it is durable with reviewers say their units have lasted for more than a year. However, the seat seems to be too small for big people. It is also squeaky/noisy when you move. Brondell S1000-EW Swash 1000 Advanced Bidet Elongated is one of the best bidet toilet seats, at least according reviewers. It has distinct washes for the rear and feminine areas. The dual, stainless steel nozzles have wide sprays. It also has a wireless remote control, as well as warm air dryer and deodorizer. I like that it has a soft closing lid that is also easy to clean. The feminine spray gives female users a refreshing cleanses. Most owners say they were able to install it under 30 minutes. However, a common complaint is that the unit isn't that durable and can break after some time. BioBidet BLISS BB-2000 is another eco-friendly bidet toilet seat that can help you minimize not only your toilet paper consumption but also your electricity consumption as well. It also offers separate spray jets for feminine parts as well as your posterior. It is also equipped with hybrid heating technology and a smart seat design. It has a wireless remote control for your convenience. It has a sleek design with a low profile design, and should make your bathroom look more contemporary. It has a 3-in-1 nozzle system for a posterior and feminine wash, as well as its patented vortex water stream. The nozzle is quick and easy to clean with its inside-out cleaning design. The nozzle is motor-driven thus it is reliable and accurate, consistent in movement. It squirts warm water and the seat is comfortable to sit on. Its water pressure is excellent, too. But flushing is a bit noisy. Tall people may find the toilet too low for them. Smart Bidet SB-1000 is an easy-to-install electric bidet that is getting a lot of positive reviews for its convenience and user-friendliness. It has a stylish design, with a multi-function control panel for ease of use. It also has a posterior wash and feminine wash, an oscillating wash, and a warm air dryer. It also has adjustable water pressure, heated water, heated seat, and safety on/off sensor. This unit fits most elongated toilets. We like that it has a wireless remote control. Its dryer temperature levels can be adjusted up to 5 settings, so you can keep the dryer warm or cool depending on your liking. The controls are also conveniently located to the right of the nozzle. These are also very easy to learn. It has a soft-close lid that prevents lids from being slammed too hard. But while the seat is easy to detach, re-attaching it can be difficult. The remote control also doesn’t respond well. For most people, the biggest reason to get a bidet toilet seat is the convenience of having warm water when cleaning themselves. Water in bidet toilet seats may be heated in two ways—through the mini water heating system of the unit, or by being directly tied to a hot water line. During the winter months, sitting on a warm toilet seat is very important. You can also turn off or on the heated seat option. This is another feature you ought to look for in a bidet, as it can eliminate the need for toilet paper. Although warm water is nice during clean up, some people would still want cold water for cleaning their posterior, especially during the hot months. It would be great if you can buy the bidet toilet seat with adjustable water temperature so you or another user will have the luxury of choosing warm or cold water.